Recently we are reading lot of news about iPhone location tracking issues. Apple's iPhone and iPad constantly track users' physical location and store the data in unencrypted files that can be read by anyone with physical access to the device. Locations are tracked by triangulating near-by cellphone towers. That suggests that the movements are tracked even when an iDevice's GPS features are turned off. Few Apple Customers filed class action lawsuit against Apple. "By secretly installing software that records users every moves Apple has accessed Plaintiffs' computers, in the course of interstate commerce or communication, in excess of the authorization provided by Plaintiffs as described in the Computer Fraud and Abuse Act," the complaint states. 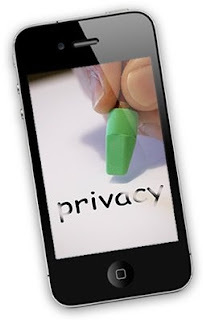 CNET reports that Microsoft's Windows Phone 7 software also collects data about device location, but does not store that location on the device itself -- instead transmitting it back to Microsoft. Student researchers at Duke and Penn State published results of an experiment in which they found that 15 of 30 popular Android apps systematically sent location data to ad networks in a variety of patterns. 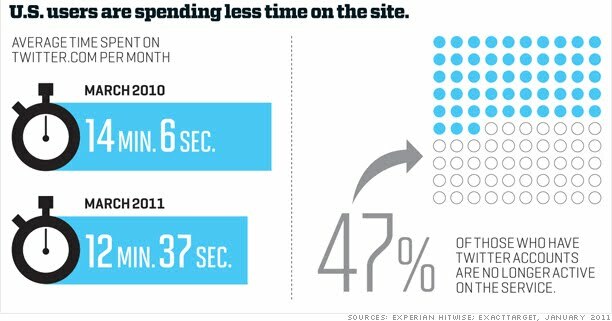 Ad networks typically track Internet users’ movements around the Web and serve up ads based on their behaviors. Note that wireless carriers also have the exact same data but they won't give it up without a court order. What do you think about this iPhone location tracking? You can share your comments and you can take the below poll. Today, we have enhanced our TheGreatQuotes.com website by implementing SEO Friendly URLs using Apache mod_rewrite module. And, we updated the code to have proper Meta details so as make it more SEO friendly. As this site is having both regular blog posts and custom changed posts, we faced some difficulties in keeping two different settings for two different types of pages. After trying various approaches, I updated some page/post details in the wordpress table itself to solve the issue. Let me know if you still get any error in using this site. And, we had made some improvements in Sharing the quotes with the friends. You can start using The Great Quotes for motivating your friends. And, I welcome your suggestions to improve it further. Few months back, I had published a detailed analysis report about the vWorker.com which is a freelance website. The vWorker.com has published the arbitration details in their website after removing some part of the discussion. i-e They published the arbitration partially after removing the important discussions which affect their stand. i-e vWorker.com is trying to give the partial information to misguide the readers. So, I am thinking whether I need to post the unedited version of the discussions and arbitration details in this blog. Since they closed my account, I couldn't get the details. But I can get it from my email as vWoker.com used to send copy of discussions to the email id. Anyway, it will take more time for me to collect all those mails and prepare the post. I will do it later when I have time and if it is really required to do it. As of now, I have asked below questions to the vWorker.com Founder Ian Ippolito. We can read the review of vWorker.com. Sony has confirmed that the personal information of 70 million PlayStation Network members may have been stolen by hackers. The stolen information include their name, home address, date of birth and credit card number with Expiry Date details. Sony blog has below information. Sony has not released any technical details of how the PlayStation Network was breached. And, Sony had admitted this personal information theft only six days after the Network was taken down. This delayed response from Sony have created a negative impression on Sony. And, Sony is trying to give below explanation for its delay in admitting the hacking. And, Sony has published FAQ page for giving answers for the common questions about this hacking and play station shutdown. This hacking affects many people in various ways. Sony PlayStation was shut-down for many days, So Customers are losing money as they were not able to use the PlayStation for the payment they made. There is a online petition going on for asking Sony to do free credit for compensating hack. Developers who have games available for download are counting the cost of lost sales. Someone who uses the same username, password and credit details across sites could find themselves seriously compromised. The affected People can ask their Credit card company to cancel their existing credit card and can ask them to issue a new one. But still they may face many problems, as the hackers can use their email address for collecting information about their other website uses by sending phishing emails..
And, this attack has raised questions about safety of online transactions. The hackers who have penetrated Sony Corp.'s online PlayStation videogame service and possibly collected credit-card data from millions of users delivered a blow to the company's long-pursued but elusive goal of linking its consumer electronic devices to an online network of movies, music and videogames. 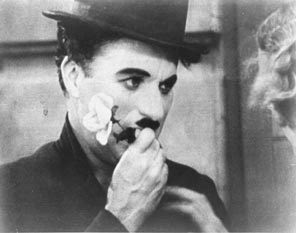 Which is your Favorite Quotes in TheGreatQuotes.com? In my previous post, I had mentioned about our TheGreatQuotes.com website for sharing inspiring Quotes with your friends. Previously, we were showing the Quotes based on the order in which they were entered. Now, we have updated our code to have an option for ordering the Quotes in specific Order. 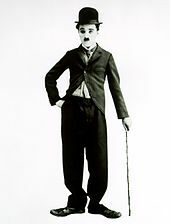 So, I would like to know the highly inspiring Quotes so that I can keep them at top of the Quotes list. You see our image quotes and text quotes. And, mention your favorite Quotes (in both Text Quotes and Image quotes) thro' the comment section. I will modify the order of the Quotes based on majority of the users' wish. And, If you like the current order itself, you can mention it thro' the comments or convey it by clicking Facebook like. Sony plans to launch two Tablets this year, and targeting No.2 position as Tablet Maker. Sony Inc. has announced that it will release two Tablets this year. They are code named as S1 and S2. So, the number of iPad competitors is increasing steadily. The S1 is a slate-style tablet computer with a 9.4-inch touchscreen display that is thick on one end and tapers. The S2 is a shell-shaped device that opens and closes, with two 5.5-inch touch-screen displays. These devices will be launched at different times in different markets. And, these two devices will also come with wireless connectivity through Wi-Fi or 3G/4G services. Sony did not specify which mobile carriers it plans to work with, and offered no details on pricing. Tokyo-based Sony said it will run the Android 3.0 "Honeycomb" operating system, which was created specifically for tablet computers. The company showed how the tablet would enable fast web browsing and would be capable of playing PlayStation-quality videogames. Both devices will run Nvidia Inc.'s Tegra 2 processors. 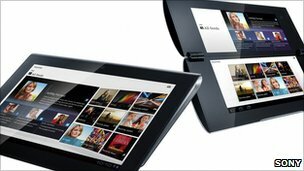 "'Sony Tablet' delivers an entertainment experience where users can enjoy cloud-based services on-the-go at any time. We’re aiming to create a new lifestyle by integrating consumer hardware, including ‘Sony Tablet’ with content and network,” said Kunimasa Suzuki, Corporate Executive, SVP, and Deputy President of Consumer Products & Services Group of Sony. Sony faces an uphill climb in the tablet computer market, already dominated by Apple's iPad. Sony has said it aims to establish itself as the No. 2 tablet maker after Apple by 2012. Through Qriocity(Network platform of Sony) music and video services, users can enjoy rich video and music content. Also, through PlayStation®Suite, users can immerse themselves in high quality first generation PlayStation® titles. Additionally, users can easily download ebook content from Reader™Store2 and use both tablets as digital reading devices. The integration with various services allows users to take their entertainment experiences on-the-go. Furthermore, “Sony Tablet” is equipped with functionality that organizes content for easy access. Check out the video on the two new Sony tablets here below. Sony is last among the world’s top 10 laptop makers to unveil tablet plans, aiming to capitalize on surging demand for a product category that expects growth of $49 billion by 2015. The late entry of Sony may undermine the company’s ability to challenge Samsung’s Galaxy Tab or the iPad. Apple had launched its first version of the industry-leading iPad in April 2010 itself. i-e One year back itself. The strength of the Sony name will likely help the electronics giant to gain some traction in the fragmented tablet market. Faced with scores of similar devices running the same Android software, recognised brands have become an important way of differentiating quality. And, BBC is highlighted that Sony Tablet is announced as pure Sony instead of Sony Ericson. Anyway, as Sony is going to use Google Android, we can expect fast growth for Sony Tablets. What do you think about it? You can share your thoughts thro' the comments and you can take this poll. And, how you are seeing this competition? As a competition between Apple and Sony? Or, as a competition between Japan company and US company? Or, as a competition between Apple iOS and Google Android? Or, as a competition between Apple and Google ? Or, as a Competition between beginner and late entry? Or, as a Competition between Open Source and Proprietary mobile OS? Find below the research firm Gartner's forecast. Global sales of tablet devices are expected to quadruple to about 294 million units between 2011 and 2015, with almost half of that Android-based. Sony, once a symbol of Japan's high-tech might, has seen its share price slide in the past decade as it struggled to keep up with rivals. Helped by its success in TVs and other products, Samsung's market capitalisation of some $134 billion dwarfs Sony's $30 billion market value. Even when Sony which is inventor of Walkman has good Brad name, many people are saying that Sony Tablet will fail as Apple may sue Sony for using its idea. And, recent shut down of Sony Play Station due to hacking attach also gives some negative impression for the Sony. Anyway, Sony has emphasised the need to differentiate its tablet from rivals, even if that takes time for getting released. You can take this poll. In my previous post, I had explained about the Free Classifieds for buying or selling iPhone and iphone related products. We use AWPCP Wordpress plug-in for showing and managing the free classified ads. This plug-in is having an option to use SEO friendly URLs. So, turned off of the SEO mode. Today, we solved this error by changing the value for "Home" in the wp_options table. I couldn't understand the relation between this change and the plug-in behaviour. Anyway, after removing the "index.php" in the Home value, the error in SEO mode of AWCP plug-in disappeared. So, now I turned on the SEO mode. So, I believe many people will start seeing the classifieds Ads by searching from various search engines such as Google, Yahoo and Bing. You can start using this Free Classifieds. Read this article "Overview of Classfied Ads" if you want details about this free classifieds. Even you can promote your blog or website related to iphone related stuff using this free classifieds site. Till today, the FeedWordpress plug-in setting was done so as to have the original source url as the permalink of the post. This setting won't allow our visitors to share our posts with their social bookmarking sites. So, I wanted to change the permalink. When I do the change in the plug-in settings for taking the local permalink, there was no way for the users to go to the original source page. So, I have made small change in the single.php of the template. I replaced "<?php the_content();?> with below piece of code. We days back, I had written about developing our Great Quotes websites. We have completed initial version of this site, and working on to add more Quotes. We included sharing options to share the favorite quotes to your friends easily thro' email, Twitter and Facebook. You can search your favorite Quotes, and browse the Quotes based on Author and Category. You can start using the Great Quotes to inspire and motivate your friends. Since this blog has started getting lot of Search traffic, I am in the process of monetizing the traffic. Few days back I had done some changes in AdSense Ad placements. The ad placement changes improved the CTR significantly and therefore AdSense earnings also will be increased. Now, I am doing further optimizations. I am using this blog for writing posts about different topics. And, recently I had modified the blog to show Recent posts, popular posts and random posts in each and every blog post. So, adSense bot may not find the appropriate keywords for any particular post as it will be surrounded with summary of other posts also. And therefore, visitors will be seeing irrelevant Ads. It will reduce the adSense CTR. So, I have implemented "Section Targeting" for this blog. "Section Targeting" is just telling the AdSense bots about which part of the blog should be considered for taking keywords to show ads, and which part should not be considered. We can use &tl;!-- google_ad_section_start --> and &tl;!-- google_ad_section_end --> to emphasize a page section. I referred this article to implement the "Section Targeting" for this Blogger blog. It seems Google AdSense will take some time to start using this "Section Targeting". Let us see whether it increases the CTR further. Anyone tried "Section Targeting"? Google Shows an excellent animated Doodle for Earth Day, and freebies for Earth Day. Today Google is showing an excellent animated Doodle for celebrating 41st anniversary of Earth Day. Earth Day was founded by United States Senator Gaylord Nelson as an environmental teach-in first held on April 22, 1970. Guardian has described this Doodle as below. Many companies and organizations are giving freebies to raise public awareness about the Earth Day. StarBucks is giving free coffee or Tea today in United States and Canada for the people who bring reusable Mug or Tumbler. Disney Store locations are giving away a free reusable Mickey Mouse tote bag to customers in exchange for five plastic shopping bags. Admission to all 394 U.S. national parks is 100 percent FREE on Earth Day! Anthropologie is offering free Earth Day craft workshops for kids. EVOS is offering customers free organic milkshakes to honor Earth Day. If you know any other Earth Day offers, you can share it thro' the comments. Find below some Earth Day Slogans. If you know any good slogan you can share it thro' the comments section. Earth Day is a reminder about the importance of environmental protection and sustainability. Most importantly, it reminds us that we can a make a difference when it comes to our planet. The Earth Day Network reports more than 1 billion people participate annually in Earth Day activities, making it the largest civic observance in the world. The Earth Day Network works with over 22,000 partners in 192 countries to spread its green message. This year’s theme is “A Billion Acts of Green” and the goal is to generate a billion acts of environmental service and advocacy before the global Earth Summit 2012 in Rio. Submit your act of green at act.earthday.org and you can pledge any others Acts. Solar power takes important role is creating Green Energy while providing clean environment. And, Google is investing more in Solar related projects,as it believes there will be a bright future for Solar power. And, Kalam-NSS initiative is taken to get electric power from Space Solar power also. Watch below the inspiring video about Earth Day. Find below the presidential proclamation from US president Barack Obama. For over 40 years, our Nation has come together on Earth Day to appreciate and raise awareness about our environment, natural heritage, and the resources upon which generations of Americans have depended. Healthy land and clean water and air are essential to the health of our communities and wildlife. Earth Day is an opportunity to renew America's commitment to preserving and protecting the state of our environment through community service and responsible stewardship. From the purity of the air we breathe and the water we drink to the condition of the land where we live, work, and play, the vitality of our natural resources has a profound influence on the well-being of our families and the strength of our economy. Our Nation has a proud conservation tradition, which includes countless individuals who have worked to safeguard our natural legacy and ensure our children can benefit from these resources. Looking to the future of our planet, American leadership will continue to be pivotal as we confront the environmental challenges that threaten the health of both our country and the globe. Today, our world faces the major global environmental challenge of a changing climate. Our entire planet must address this problem because no nation, however large or small, wealthy or poor, can escape the impact of climate change. The United States can be a leader in reducing the dangerous pollution that causes global warming and can propel these advances by investing in the clean energy technologies, markets, and practices that will empower us to win the future. While our changing climate requires international leadership, global action on clean energy and climate change must be joined with local action. Every American deserves the cleanest air, the safest water, and unpolluted land, and each person can take steps to protect those precious resources. When we reduce environmental hazards, especially in our most overburdened and polluted cities and neighborhoods, we prioritize the health of our families, and move towards building the clean energy economy of the 21st century. To meet this responsibility, Federal and local programs will continue to ensure our Nation's clean air and water laws are effective, that our communities are protected from contaminated sites and other pollution, and that our children are safe from chemicals, toxins, and other environmental threats. Partnerships and community-driven strategies, like those highlighted by the America's Great Outdoors Initiative, are vital to building a future where children have access to outdoor places close to their homes; where our efforts to leave rural working lands and waters are conserved and restored; and our parks, forests, waters, and other natural areas are protected for future generations. On Earth Day, we recognize the role that each of us can play in preserving our natural heritage. To protect our environment, keep our communities healthy, and help develop the economy of the future, I encourage all Americans to visit www.WhiteHouse.Gov/EarthDay to learn ways to protect and preserve our environment for centuries to come. I have just noticed that Google is showing this animated Doodle by combining many images. Find below some of them. And, I had recorded as video also so that it can be viewed by people who are not able to see it in Google Home page. Free Classifieds Ads for buying and selling iPhone related products. Few months back, we have launched a website VerizonIphoneGuide.info for showing latest news about smart phones especially about Verizon iphones. Surprisingly, this site started getting lot of visitors from search engines especially from Google. Google Analytics shows that everyone is coming to this site by searching something related to iPhone. So, I thought of effectively utilizing this Targeted Traffic. And therefore, we added classifieds feature to this site. You can see more details about using this Classifieds here. You can freely show the Ads for 10 days. If you want to show it for 30 days, you can choose paid option. And, placing you classifieds Ads is very simple and you can easily edit it at any time using access key. You can use the "General" category to advertise your blogs and other products also. Since I am planning to advertise this classifieds feature in all our websites and blogs, I think it will get some more traffic also. India has launched PSLV C16 Successfully today. ISRO has announced as "PSLV-C16 successfully launches RESOURCESAT-2, YOUTHSAT & X-SAT"
It was launched from Satish Dhawan Space Centre at Sriharikota, India. This Success is very important for the ISRO as it was facing some difficulties recently. Four ISRO made satellites failed one after the other. The organisation was singed by the S-band corruption scandal when the ISRO-Devas deal was annulled by the government. Find below the video of PSLV C16 launch as viewed from South Chennai. It puts below 3 satellites. RESOURCESAT-2 built by ISRO (Indian Space Research Organization) - the primary satellite is an advanced remote sensing satellite weighing 1206 kg for facilitating the study and management of natural resources. YOUTHSAT weighing 92 kg is a joint Indo-Russian satellite for stellar and atmospheric studies. Among the key launches undertaken by the PSLV are India's maiden moon mission Chandrayaan-I in October 2008, four Cartosats and Resourcesat-1. The Chandrayaan-I has helped NASA to find Water on the Moon. Team of seven high school students from Punjab, India won the Grand Prize for the 2011 NASA/NSS Space Settlement Contest. They had done a double-torus space settlement design called Hyperion. The winning design was selected from 355 submissions from 14 countries. The Hyperion Space Settlement has a diameter of 1.8 kilometers and would provide a safe and pleasant living and working environment for 18,000 full time residents and an additional population (not to exceed 2,000) of business and official visitors, guests of residents, and vacationers. The settlement would be constructed primarily from lunar materials and be located at the Earth-Moon L4 libration point. You can download the complete details as pdf file from here. They have given the below explanation to explain why they choose "Hyperion"
Find below the high lights from their report. - Using the advantage of living in space in best possible way and attain best structural support and stability. - Providing large surface area for living so as to occupy large number of people in a single settlement. ambitions to go and search outer space especially Mars and whole Solar System. - Hyperion’s structure is the best model showing strength, stability and large surface area for living. The structure has some splendid features such as a non-rotating torus which provides the thrill and excitement of full space-life experience to the residents and tourist. - Ultimate arrays of technologies and robots have been added to give life a new height. An astounding docking section has been built which provides a bi-transit system having different docks for import - export and residents - transient population. between a variety of housing plans and lifestyle. Personal Rapid Transport, called POD,is installed in both the residential tori for easy and fast movement of the residents. practices. The settlement would support multilateral trade. turn, we shall buy goods for its needs from Earth, if required. Congratulations for the below winning students. If you are planning to attend ISDC 2011, see the ISDC Space Settlement Students Web Site. Launching TimeSheetScript.Com for giving all details about our TimeSheet Script. We have developed a new website TimeSheetScript.Com for giving all details about our timesheet script. We have provided all the details about our timesheet script. It includes details such as features of our timesheet, who can buy our timesheet, how to buy our timesheet, how to install our timesheet, how to use our free online timesheet, etc. The Launch Authorisation Board (LAB) for PSLV-C16/RESOURCESAT-2 mission met on April 16, 2011 at Satish Dhawan Space Centre - SHAR, Sriharikota. And, LAB has cleared the launch of PSLV-C16 at 10:12 hrs (IST) on Wednesday, April 20, 2011. LAB reviewed the readiness of the launch vehicle, spacecraft systems and ground stations and has authorised the commencement of the 54 hour Count Down today. During the Count Down, propellant-filling operations of the liquid propellant second stage (PS2) and fourth stage (PS4) of the launch vehicle will be carried out. Mandatory checks on the launch vehicle and spacecraft - including charging of batteries and pressurisation of propellant tanks will be performed. Readiness of launch infrastructure such as tracking radar systems and communication networks will also be checked. PSLV-C16 will launch RESOURCESAT-2, YOUTHSAT and X-SAT satellites. The PSLV (Polar Satellite Launch Vehicle) has launched 41 satellites (19 Indian and 22 from other countries) into a variety of orbits till date. PSLV can launch IRS (Indian Remote Sensing) Satellites into sun synchronous orbits, and it can also launch small size satellites into geostationary transfer orbit (GTO). The PSLV has four stages using solid and liquid propulsion systems alternately. ResourceSat-2 is a data continuity mission of ISRO with improved spectral bands of the IRS-P6/ResourceSat-1. Each ResourceSat satellite carries three electrooptical cameras as its payload: LISS-3, LISS-4 and AWiFS. All the three imagers are multispectral pushbroom scanners with linear array CCDs as detectors. The ResourceSat data find their application in several areas like agricultural crop discrimination and monitoring, crop acreage/yield estimation, precision farming, water resources, forest mapping, rural infrastructure development, disaster management etc. ResourceSat-2 provides continuity and increases the observation timeliness (repetivity) in tandem with ResourceSat-1. Read more details about ResourceSat-2 here. YouthSat was initially proposed by Dr. ABJ Kalam during his visit to Russia during 2005. It is the second satellite in the micro satellite series being launched by ISRO. The objective of this project is to provide hands-on experience to student in space experiments and data-processing, and to create a common platform for aerospace students across the world to jointly conduct experiments in space for the benefit of future generations and humanity as a whole. The Russian party - M.V. Lomonosov Moscow State University - provides the development of the scientific equipment SolRad for the studies of the solar activity, its delivery to India, and transfer of the necessary technical documentation and testing equipment. The experimental equipment SolRad is intended for registration of hard X-ray radiation within the energy ranges of 10-100 keV. Read more details about YouthSat here. Nanyang Technological University (NTU), Singapore is doing the XSAT Micro-Satellite Project which is the developmental project undertaken by CREST (Centre For Research in Satellite Technologies) with partners such as CRISP (Centre for Remote Imaging, Sensing and Processing, NUS). Read more details about X-SAT here. Twitter suspends QualityPoint Application also. Trouble @Twitter? Twitter is the fast growing social media company. Twitter is providing an API for creating third-party applications by accessing Twitter data. Thousands of (Around 750,000) third-party Twitter applications/clients are available. Even some applications are more popular than Twitter's own web interface. Even if these third-party applications helped Twitter to grow fast, Twitter had decided to ban these third-party applications. Twitter had started this third-party clients ban starting from Ubermedia clients such as UberTwitter and Twidroyd. And, Twitter had asked the Developers to stop building clients. Engadget has mentioned that Twitter is implementing these restriction to start monetize its services. Engadget has given title as "Twitter to developers: we want to own the pipes, water, and faucets, but feel free to make soap" for this news. We also developed many useful Twitter applications, and currently we use it internally. And, we had lot of plans to improve our Twitter Clients further. But yesterday, I got an email from Twitter saying that "This is a notice that your OAuth token for QualityPoint has been suspended from interacting with the Twitter API." Since all our Twitter clients use this application, nothing is working now. As Twitter starts hating third-party Twitter applications, I am planning to reduce our focus on developing Twitter clients/applications. Instead, I am planning to focus more on developing our jobsite. We already introduced Resume Posting service, and working on to release lot of new features including meta job search engines for regular jobs and freelance jobs. Since the Social media sites get revenue from job advertisements, I think running job site is wiser than working with other social media sites such as Twitter which won't hesitate to ban any developers to monetize their services.. If anyone wants to start their own Resume posting service, you can contact me. Apart from our Twitter application, few of our Twitter accounts also got suspended. But I didn't get any mail from Twitter about this account suspension. So, I had sent below message to twitter support "suspended@twitter.com". you solve this issue as soon as possible? And, I got below reply from Twitter Support Team. ticket and trigger a review of your account. received an email notification to the address associated with your Twitter account. look at your case. Our apologies if the error turns out to be ours. Since I didn't find any appropriate reason from the links provided by the Twitter Support Team, I sent below reply. I have gone thro' your links. a technical issue from Twitter side. Can you solve it as soon as possible? suspended pending more information being provided. Twitter accounts once after testing it. started creating images/logos required for twitter accounts. won't give any benefit to anyone. And, we create accounts manually only. don't think that we are violating any Twitter Terms/rules. depending on the Twitter for our business. And, it is really very difficult to give lists asked by you. ownership for those accounts even if we need to manage them. If possible, you can reinstate all or most of our suspended accounts. As such, these accounts will remain suspended. Following Limits & Best Practices (http://support.twitter.com/entries/68916). It seems Twitter support is very active and they they are sending reply quickly. And a notable point is, our application "qualitypoint" got suspended after I had done these communications with Twitter about our Twitter Account suspension. I am NOT sure whether there is any relation between them. If you know more details, you can share your comments. It looks like Twitter is in Trouble. Fortune magazine has done a detailed analysis about Twitter and published an article Trouble @Twitter. It says that Boardroom power plays, disgruntled founders, and CEO switcheroos are clipping the wings of this tech high flier. And, Biz Stone has tried to answer for the Fortune Magazine article. 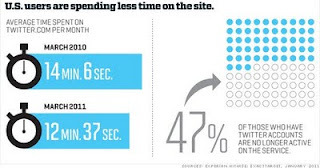 Business Insider has described this as "The Truth About Twitter's Troubles" . The story touches on Twitter's lack of revenues, its management discord, its relatively small user-base, and its refusal to accept huge multi-billion dollar offers from the likes of Google and Facebook. The truth about these troubles is that the company, operating under new CEO and a re-constituted board since last fall, knows it has them, and is re-organizing the entire company around fixing them. So, it seems Twitter is facing high pressure from media to improve the quality of tweets. That may be the reason Twitter suspending third-party applications and twitter accounts rigorously. But I think, this unplanned and inappropriate suspensions will do more harm to Twitter than doing any help. What do you say? Till now I didn't get any reply from Twitter regarding reactivating our Twitter application. So, I have decided to choose web based access than using API. Our Team is good in creating web based scripts. For example, we have created a script which will automatically post resume to around 60 job sites. So, We have started creating scripts for sending tweets without using API. Currently we are testing it. I will give more details once after completing it. We have resolved the issue by registering new twitter application. Anyway, we are ready with script for the web based also. This post is getting displayed by selecting a post randomly from this blog. You can refresh the page if you want to see another Random Post. And, you can get the latest posts in your email inbox itself. 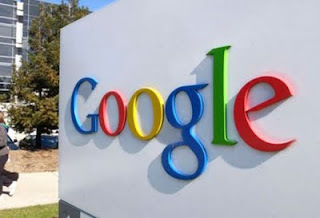 Google-owned sites generated revenues of $5.88 billion, or 69% of total revenues, in the first quarter of 2011. On a worldwide basis, Google employed 26,316 full-time employees as of March 31, 2011, up from 24,400 full-time employees as of December 31, 2010. Google has about a 65% share of the US search engine market and about 90% in Europe. The latest figures show that the number of times people click on Google ads that are sponsored by advertisers rose by 18%. Even if the Google shows sharp rise in the earnings, Price of Google Shares went down, as this earning report didn't meet the expectations of the investors. Google co-founder Larry Page, who replaced Eric Schmidt as CEO after the quarter ended, has indicated he plans to keep investing in long-term opportunities that may take years to pay off, even if that affects the short-term results. Forbes describes Larry Page as Wartime CEO. Recently Google had invested $168 Million in Solar Power Tower project. Investors are hungry for details about Larry Page's management plans and strategy as the search giant faces sharp competition from Facebook and Apple Inc, and intensifying regulatory scrutiny. This blog qualitypoint.blogspot.com is getting lot of traffic and it is getting increased daily.. Most of the traffic is coming from Search Engines especially from Google. Even if this blog gets Good amount of traffic, AdSense revenue is low as the CTR is very less. Normally CTR will be low if the traffic is a non-targetted traffic from social media sites. But this site is getting targeted traffic from search engines. And, CPC of adSense in this blog is in satisfactory level. So, the only way to increase the eCPM is to increase the CTR. So, I thought of optimizing the ad placement of adSense Ads so as to increase the CTR. Last few days I am doing detailed analysis about adSense optimization. I have gone thro' various sites which are successful with adSense revenue. And, I referred the sites which are sold at good rate in various website marketing places such as digitalpoint Forum and Flippa. It seems everyone is using different approach. It seems the ad placement which works for few sites may not work for other few sites. We need find the best ad placement only by doing trial and error approach. So, I had rearranged the Ads differently in this blog and continuously monitoring the CTR, CPC and eCPM to find the optimized ad placement. The current ad placement looks good for me as it increases visibility of AdSense ads without irritating the users. Anyway, I am not going to finalize the ad placement without getting good metrics from the AdSense Report. Let us see how the test results are coming up. You may add your comments about this ad placement. If you are interested to show advertisements in this blog using Google AdWords you can refer the Google Adplanner Reports. We are working on to develop a website for showing great Motivational and Inspirational Quotes. We are planning to add lot of text Quotes and Image Quotes. Our Team has developed an Admin panel for easily adding and managing the Quotes. And, we plan to develop it continuously. If you have any suggestions, you can share it thro' the comments. Google invests in Word's largest Solar Power Tower plant "ivanpah"
Google has invested $168 Million in Ivanpah Mojave Desert solar energy plant in California. Google is financing this $168 Million to BrightSource Energy. BrightSource also has lined up $1.6 billion in loans guaranteed by the U.S. Department of Energy and a $300 million investment from NRG Energy Inc. This Solar Energy plant aims to produce enough solar energy to light 140,000 homes. Construction of this 450 ft tall tower began in October 2010 and is being looked after by one of the world’s leading construction companies, Bechtel. 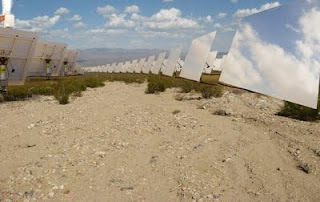 And, the Ivanpah project is expected to be completed in 2013. When constructed, Ivanpah will be the first large-scale solar thermal project built in California in nearly two decades, and the largest in the world. This plant will be located on 3,600 acres of land in the Mojave Desert. It is expected to generate 392 MW of solar energy . It will be functioning based on an assembly consisting of 173,000 heliostats. Although solar power tower development is currently less advanced than the more common trough systems, they offer higher efficiency and better energy storage capabilities. The heliostats – mirrors that focus the sun’s rays onto a solar receiver located at the top of the tower – will enable concentration of a large amount of solar energy onto one small area. This would further enable the solar receiver to generate steam that spins a turbine and generates electricity. 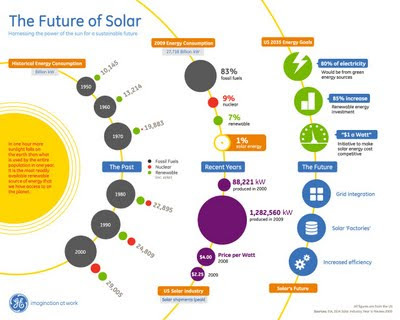 You can read this article about Solar power to easily understand Solar energy. Google is always investing in Alternative Energy sources. 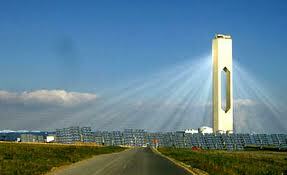 So, it's not surprising that Google is investing in Solar power Tower. More companies may follow Google's example and invest in alternative energy technology. Even if the the companies like Google have started investing in Solar energy, still lot of people are thinking that Solar power is more expensive and investing in Solar energy is not worth. What do you think about Google's behaviour? Is Google planning its future by investing in alternative energy, or is this based on more humanitarian motives? You can share your thoughts thro' the comments.